Re: What would YOU do?? Jumped back onto the camel for the first time in ages and find an interesting thread - thanks Mark. I'm not sure I have a clear cut answer but I would like to share something that happened to my recently as it is similar but from the "other side". Anyway fast forward to the wedding day - it rained from 11am to 7:30pm, without a break and pretty hard. Bride and groom married outdoors, even though it rained, because venue, once set up for the wedding reception HAD NO INDOOR SPACE. It was a horrible nightmare of an event. I was lucky enough to be there with a great wedding filmmaker guy I'd worked with a few times before, and we get on really well. So. Ceremony ends at 1pm. Rain all afternoon. No space indoors for photos. Bride WILL NOT go outdoors even with umbrellas until rain ends. No trees with enough leaves to put bride and groom under for shots. So what happens - everyone gets very drunk. Fast forward to after the meal. Sun comes out at 7:40. I get everyone outside for the big group shot of everyone - it's a nightmare because all the bride and groom's friends, in their early 20's are near to falling down drunk. They are loud and obnoxious. Despite this I organise them and subsequent groups as best I can, video guy tells me that I'm doing an amazing job and he'd have given up. Eventually, manage some really nice romantic shots of the bride and groom alone, even though the groom keeps almost pulling the bride over as they walk because he is so drunk. I'm happy I managed to get the group shots I did, although I'm aware they aren't as well posed as some I've taken due to the drunkeness plus the fact the strong low evening sunshine and the fact the venue's lawn area are on a slope give limited options for how people can be positioned. 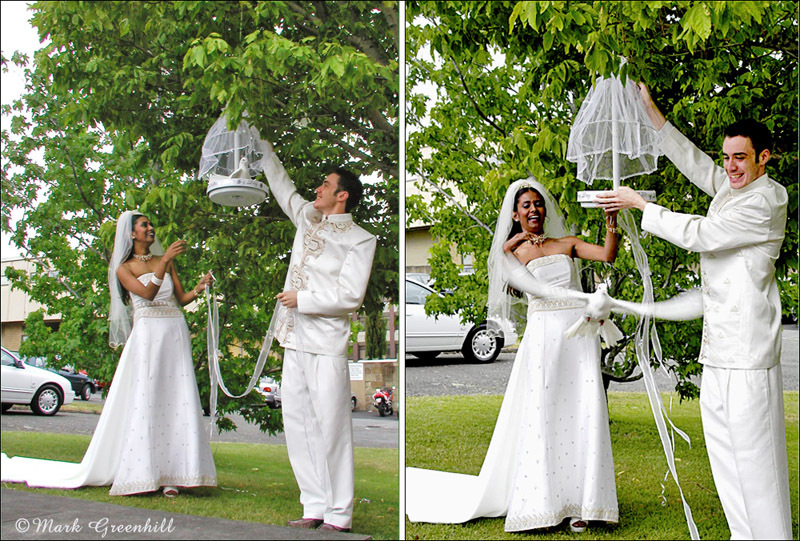 I get the photos processed from RAW and online for the bride and groom. 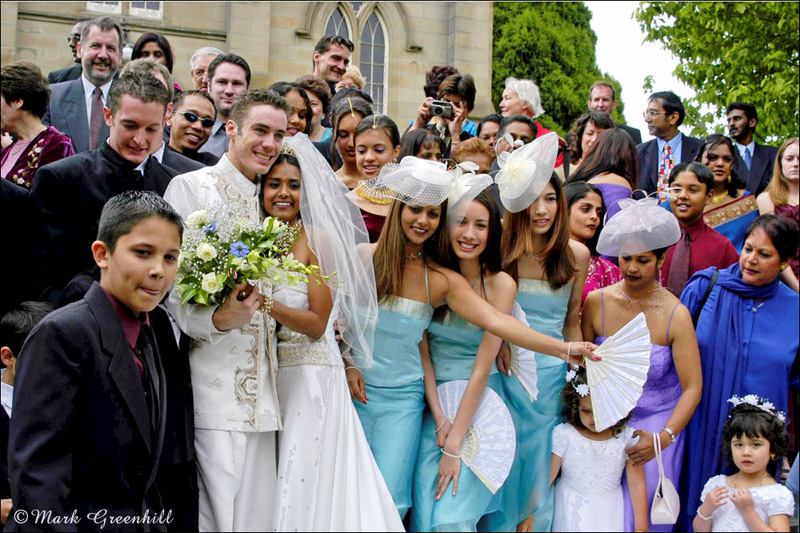 I think they'll be happy as they show everyone having fun, the bride and groom look in love, and before hand although I've had notification of groups they want, they have told me in person AND IN WRITING they want them "imformal and not posy". What if that videographer had taken some groups and they liked his better? What if he'd just said "Yes, I'd have done it differently". I know this is a much different situation than the one Mark describes, but I personally think we'd all be better people if maybe we could support each other whilst working and accept that some days one of us may be better at something than someone else and you just have to keep quiet about it. In Mark's case - yes his photo is WAAAY better in terms of lighting, posing, composition etc. The other photographer's is though more relaxed and the couple look "silly happy". I don't really like it at all - but maybe that's what they wanted? Mark - did the photographer give them others with different posing and lighting at that spot - have you seen them all? I would do something similar to what Photodynamics describes in post #9. I'm thinking that I'd gift it to them. Makes you look great, and doesn't kill the photographer's sales. You're already paid, and did your job, and this is simply icing on the cake. Might be a wakeup call to the photographer. If you were hired to capture the wedding and that's how you make your living, I don't see any problem with offering them a small selection of your best still shots. I am the official photographer at my local speedway and when other photographers approach me asking if they can sell any of their images from the track, I tell them to have at it. If they have a better image of something why deny the customer that? Unless there is a contract forbidding it, I feel the same goes here. Most likely they wouldn't buy the "hired gun's" photo in in the first place (at least I wouldn't). Sorry for the delay in responding Sis. I've been away from the computer alot lately. Fair Use allows the use a photograph for comparison, parody or editorial use without the permission of the creator. I blurred the logo of the creator to prevent any hurt feelings. I do not know the law on blurring logos. I have seen them all. All I'll say is that I wouldn't have done it the way the hired gun did. Keep in mind the two shots posted were half way through the reception. All formals were done way earlier. I watched the photographer (there were two) working the posed images. No flash, hand held, low sun to the subject's back. You can already see in your head what I saw online. I'd made previous arrangements to meet the couple just outside the back door of the facility for the shot you see here. When the hired gun heard that, she jumped in and did a few of her own. Seen above. That's cool. It was her gig. When she was done, I did mine. Since I originally posted this image, I've heard grumblings within the photographic community that she wasn't happy I was shooting and that I was intentionally making her look bad. (My initial reaction was that she didn't need my help to look bad....she was doing fine on her own). Photography education is available to anyone who wants it. Anyone will sell you a book, DVD or post a how-to video. That's how I learned it. If you wanna get better, get off your a** and do it. It's that simple. To take a client's money with very little forethought, education or practice,....I think that's being irresponsible. Nice image Mark. 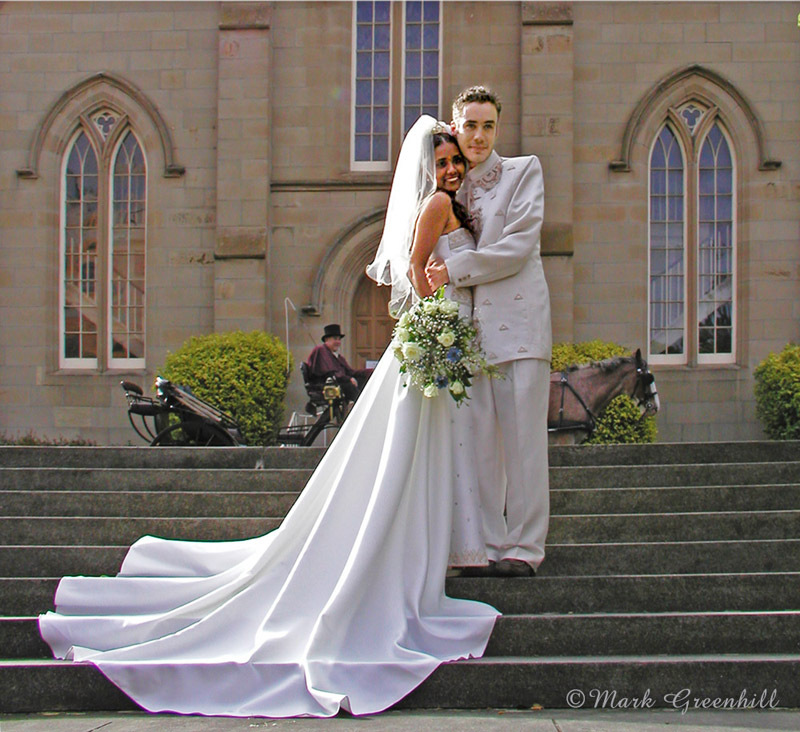 For the newer shooters, notice that in Mark's image: Grooms face is thinner, bride's face is thinner, detail in the white gown is visible, and at that lower angle, with a longer lens, they appear taller and more regal. They are framed with a tree in the foreground, the dirt isn't visible, nor are the distracting homes in the background. The sky and pose are easy differences to notice, but Mark took this to a whole new level by paying attention to all the other details. Nice work! I have studied photography seriously for over 40 years and digital imaging for 23 years and continue to do both. If ever I thought I had “arrived” or reached any sort of “standard” I would pack [it] in because what I would have reached was a plateau and would then probably be incapable of learning new things……I hope this never happens. Images shot 5 minutes apart. Left is the hired gun's image. Right is mine. I was not the official photographer for this wedding. I shot video. But I always take a few still shots to adorn the video case we create. In this case, the photographer told me she'd been in business in our town for 10 years, but i'd never heard of her. I could tell she was out of place and wasn't comfortable behind the camera. In the past we've had family approach us about buying our images if the hired gun's images fell short. (See post #6 in How to Hire a Wedding Photographer). Would you sell your images to the client if you were not the official photographer? Side note: "Exclusive Photographer" line item is wedding contracts are invalid in most states. I noticed their photographer setting up in front of the church and clearly ill at ease, I had my cameras in the car and did a paparazzi shoot. I waited for a month before contacting the couple who bought the shoot. They had been bitterly disappointed with the hired gun. Nice Images Mark Greenhill. Especially the last one. Similar thing happened to me recently. Couple invited wife and I to be guests at their wedding. Both photographers were next to each other almost all night, chimping away, showing each other what they shot, and sat in the back row of the church for most of the ceremony. I have some shots that they missed, but have only sent them a few via Facebook. Think I'll just hang on to the rest, as the wedding was about 6 months ago, and they haven't asked for any more. Wouldn't be about making money. Had a similar situation this past weekend. We went to the outdoor wedding of some very dear long term friends granddaughter. We were there as guests and my wife had helped with a wedding shower approximately a month ago. I took pics at the shower at the request of family members who were giving it and gave them to the family member in charge of the shower. I am strictly a hobbyist and make no money from my photos nor do I intend to. At the wedding, outdoors and a poorly lighted covered venue, the hired photographer shot the entire wedding and reception with a Canon 80D, 50mm 1.8 lens and the pop-up flash. Have not seen any of them. With her permission, I took about 80 shots with gear I had with me. The grandparents had asked me to take them. I have no reason to doubt that my shots were better than hers. Did some processing, converted to jpegs and gave them to the grandparents. Was really surprised to see a paid photographer using the equipment she had.